1. Add a little water to sugar and bring to a boil. 2. When it starts to thicken, add the mashed potatoes and khoya. 4. Add little ghee from time to time and keep stirring. 5. When it reaches a halwa consistency, add milk maid and mix well. 6. Remove from flame and stir once or twice. 7. Add the fried cashewnuts, raisins and camphor. 8. Pour into a greased plate (or bowl) and allow it to cool. 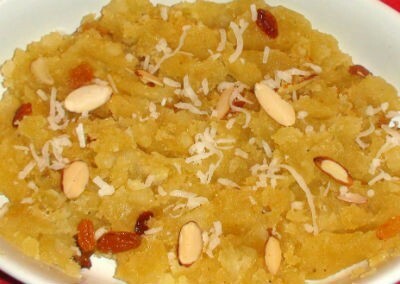 Feel free to comment or share your thoughts on this Aloo Halwa Recipe from Awesome Cuisine.